Beautiful. I wonder where it got it’s name. It can’t be because it was balm for bees. I have a huge beebalm that I planted last year, I’m awaiting the flowers. They should be opening soon! Beebalm is a source of Bergamot, the flavoring for Earl Grey tea. 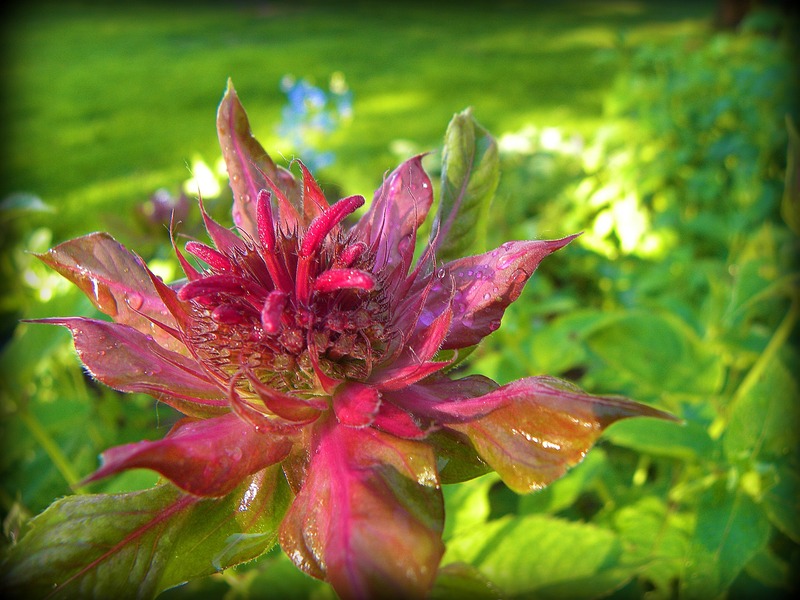 During the time of the Boston Tea Party when there was no black tea, beebalm leaves were used for tea. The wild version, Monarda Fistulosa, is also known as horsemint. One of the uses the Blackfoot Indians had was to use boiled leaves as a poultice, applied directly to pimples to bring them out. It’s not too much of a stretch to go from there to using it as a poultice on bee stings, perhaps that’s where the name comes from. Also, if you have trouble with deer in your garden, beebalm is deer-resistant. My poor bee balm is getting very crowded by . . . whatever those shrubs are . . . spirea, maybe? I need to move it. Remind me next spring, please. I’m surprised it’s not the other way around… our bee balm crowds everything else out. An awesome flower! It should be crowded with bees and butterflies. I know it as Pferdeminze or Goldmelisse.Very very nice! I did not see this flower before. I think this plant would love your beautiful garden. 🙂 You have a good Sunday too. Hugs (as always) to you and Flora. How exotic! thanks for sharing as always…. Bee balm is a wonderful plant for attracting butterflies and helpful bees. This prairie native has fascinating-shape flowers in jewel tones of red, pink, purple, and white, surrounded by dark bracts. They grow atop substantial clumps of dark foliage. The aromatic foliage is sometimes used for making tea, and bee balm is often grown in herb gardens. Established plants tend to spread, especially in damp soil. This plant is extremely prone to mildew problems, so be sure to plant in full sun and seek out cultivars touted as resistant to mildew diseases. Thank you, Justina. You are very helpful:-) Looks like it would do well here. What a gorgeous bloom! I’ve heard of bee balm, but never actually knew what it looked like (of course now I want to know if it will grow here *laugh). Gorgeous and I didn’t realize how beautiful and unique looking flower it is! Wish that I am there to see and smell it! That’s a weirdly wonderful flower. Does it smell sweet?